We've finally seen the back of winter and the end of year festivities are starting to kick off. One of the biggest social happenings on the Victorian calendar is the Spring Racing Carnival, when Melbourne plays host to a bevy of fun-loving folk who fancy a punt, or just want to glam up for a day out. If you're planning on visiting The Place To Be for a day at the races, we have your trip sorted. Ovolo Hotel, 19 Little Bourke Street, Melbourne. This boutique hotel couldn't be in a better spot. Boasting 40 rooms, book the penthouse and you have room to sleep four -- meaning the cost is actually quite reasonable. Fitted out with a full kitchen, it feels more like an apartment than a hotel. Challenge your friends to a pinball showdown (yes, there's a machine in the living room), or pack your swimmers for a soak in the jacuzzi on the balcony. Arguably the best part is the free mini bar (including beer and a huge jar of Jaffas). St.Jeromes The Hotel, 271 Little Lonsdale Street, Melbourne. Camping and a CBD don't often go hand in hand, though this is the case with St.Jeromes The Hotel. "An urban experience like no other," you’ll sleep in luxury tents upon the building's rooftop. Boasting complimentary Grill'd burger delivery from 8pm to 10pm, breakfast hampers, morning meditation classes and an onsite barista, you're certainly not roughing it. A pretty different stay indeed. Wrapped in 360-degree city views and @linen_house's new Spring collection as part of their 15/16 Preview tonight. Bundle up. Miss Fox, 285 Little Collins Street, Melbourne. You’ll probably want to have a blow dry, get a manicure or have your makeup done before you head off to the track. At Miss Fox you can do all three. Look for it on street level and you’ll likely miss it -- the day spa is tucked away up a grand staircase which opens up to a world of vintage glamour (think French armchairs and gilded mirrors). The staff are the best in the business, and super fun too -- you’ll have a great chat as well as good hair. Progressive Dinner and Cocktail Tour with Melbourne Food Experiences. 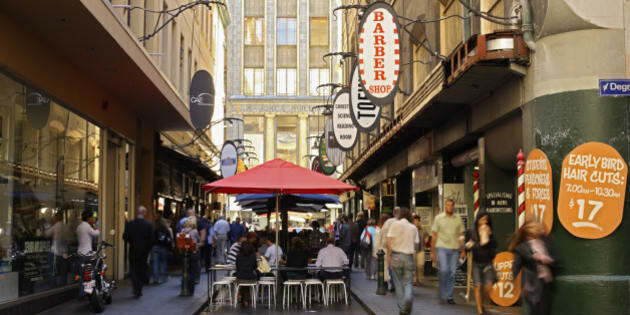 Melbourne loves to keep a secret, hiding its best eateries and watering holes away in alleys with little to no signage. You really need to be with a local to know what's new and what's good, which is where Alan Campion comes in. A well known and respected chef and food writer, Campion or one of his guides will take your group on a journey through Melbourne's magical lane-ways, stopping to eat at and drink at various spots along the way (such as 1806, Pasturo, Coda, Lee Ho Fook and San Telmo, to name just a few). Hidden Secrets Lanes and Arcades Tour. Speaking of the famous lane-ways, there's so much more to learn about these mysterious streets than just restaurants. Hidden Secrets specialises in tours through the winding side streets -- pointing out interesting architecture, local designers and boutiques, historical spots and Instagram-worthy street art. Definitely not your average tour.